It’s been a rough winter, hasn’t it? Here in central North Carolina, my son has finally returned to school after nearly two weeks of cancellations due to nasty weather. And yet our little bit of snow is nothing compared to what you folks in the northeast and elsewhere have endured. 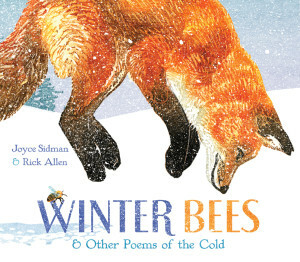 Sounds like just the right weather to break out the hot cocoa—or something stronger, if you prefer—and read Joyce Sidman’s latest poetry collection, Winter Bees & Other Poems of the Cold (Houghton Mifflin Harcourt, 2014), illustrated by Rick Allen. Brevity. Poems pack a lot of meaning into very little space. A story can be told and a world created in just a few lines. Precision. With so few words, every single one must count—as Tammi Sauer put it so well in this post. Rhythm. Whether or not they’re written in rhyme, poems have a pleasing rhythm to them—as do the best picture books. Sound. Since poems, like picture books, are meant to be read aloud, poets and picture book writers use many of the same tools—e.g., alliteration, assonance, onomatopoeia, and repetition—to make their words pleasing to the ear. Satisfying Endings. The last lines of a poem—like the final page turn of a picture book—should have an impact, making readers laugh, cry, or simply look at things in a different way. In addition, the variety found in most poetry collections encourages us to experiment with our own work. The twelve poems in Winter Bees, for example, are told in different voices, from various points of view, and in a variety of forms—including rhyme and free verse. Reading them reminds me how important it is to approach writing with the same sort of openness, and to be willing to stray from my initial idea, break some habits, and try new things. But on to the poems! Like many of Joyce’s other collections, Winter Bees combines poetry with a natural science lesson—in the form of a fact-filled sidebar—all wrapped up in a gorgeously illustrated package. Here are two examples (find more at the Houghton Mifflin Harcourt blog). In the first, “Big Brown Moose,” note how the language, rhythm, and repetition—not to mention the moose’s bellowing voice and attitude—make the poem so much fun to read aloud. The second example—“What Do the Trees Know?”—is probably my favorite poem in the collection. Here Joyce introduces another rhyme pattern and a new format—the Q&A. If, like me, you’ve had a touch of cabin fever this winter, you may find it especially comforting. A note about design: the book opens and closes with two stunning wordless spreads that serve as perfect bookends to the poems. Illustrator Rick Allen and his artist wife Marian Lansky (who have a very appealing online shop at Kenspeckle Letterpress) graciously shared these with me. The opening spread shows a branch letting go of two lingering maple leaves. Notice the snowflakes swirling on the right side, indicating winter’s approach. The closing spread shows the same branch, now with swelling buds unfurling tiny green leaves. The snowflakes are now on the left as winter recedes. It’s an exquisite detail, and—for those of us shivering, shoveling, and otherwise slogging through these wintry months—a hopeful reminder that spring really is just around the corner. Any thoughts about poetry, art, cabin fever? Please share. P.S. In case you missed it in Tammi’s last post, the winners of the Little Baby Buttercup giveaway were Colleen Kelley and and Kristi Veitenheimer. Thank you for all the comments! Joyce Sidman, Linda Ashman, Marian Lansky, non-fiction, poetry, Rick Allen, science, Winter Bees. Bookmark. This is one gorgeous book, Linda. I agree with Rebecca. Thanks for spotlighting this one. I love it and have put it on hold at my public library. Lovely! Great! I know you’ll enjoy it, Linda. Our snow finally melted here, but more chilly weather ahead. Thanks, Suzy. Here’s to spring! Lovely post – I’m looking forward to reading this lovely book. Thanks, Claire. It is lovely indeed! I also love “What Do the Trees Know?” The illustrations do such a good job of complementing these poems. Absolutely beautiful, Linda! And I just love your comparison(s) to picture books being like a poem— fantastic! Thanks, Jennifer. And thank you for your help with the glitch (sorry for making things worse!). And I love the poem “How To Find a Poem” in her collection, What the Heart Knows. I have it hanging on my bulletin board for inspiration. Her books are wonderful, aren’t they? And every single one is gorgeous. In addition to the ones you mentioned, I also love This is Just to Say. Anything by Joyce Sidman is high on my list. I love this book and own a copy. I had to have it. It is exquisite — both text and art. Oh, no! I hope your internet is back up and running soon. In the meantime, I can’t imagine a better place to be than the library. Such a beautiful read! And your comparisons between poetry and picture books are spot on. Off to read more poetry! First time commenter here. 🙂 Love this post! Joyce’s books are a feast for the ears and eyes–I adore them. Your points about the appeal of poetry are perfect–love the point about precision, especially (holy cow, there’s alliteration for ya!). Poetry pack a big punch in a tiny bit of text, so each word holds heavy weight–love that reminder. Going to read WINTER BEES now to my kiddos tonight (winter storm warning in effect for TX–I know that’s nothing, by comparison, to the Northerners here, but brrrr!). Thanks for the lovely poetry inspiration! Thanks for commenting, Jennifer–and for all that lovely alliteration. Stay warm! What an elegant and lovely post. A perfect explication of Joyce Sidman’s poetry and the elements of wonderful children’s poems. Thank you! And what a nice comment! Thank you, Leslie. Thank you so much, Linda. This is lovely! Thank YOU, Marian, for sharing those gorgeous spreads. So nice to meet you (albeit electronically)! I love your reasons for reading poetry, Linda. It’s not just for those who write in rhyme! I think I own all of Joyce Sidman’s books, including Winter Bees — she is amazing. And Rick Allen’s illustrations enrich each and every poem.